I remember my favorite present. I was about 7 and woke up one morning to find three new and shiny things next to my bed. 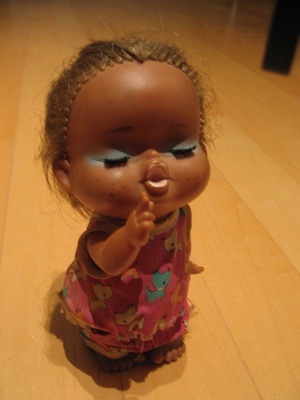 A hip little doll baby with caramel skin, freckles, lashes and blue eyeshadow. She sported matching shorts and tunic in Fuchsia pink with jewel-tone Scottie dogs in turquoise, emerald and yellow. A.A. Milne’s The House at Pooh Corner. And a string of ceramic clown heads. I loved the gift because it was unexpected. My Dad had been on an Oktoberfest trip to Holland and I fully realized how nice and unusual it was that he would have taken the time to pick out the gifts. Not that he was mean, but present-buying was generally a Mum thing. I loved the doll…and confess I still have her. Her auburn hair is faded. The clothes are ragged and sun-bleached. The House at Pooh Corner rapidly became a favorite. The clowns were a little ugly and scary but their association with the first two gifts protected them. My next most favorite present was probably a year later. Great Uncle James took me into a toy shop in Wilmslow. He bought me a watch! A black-strapped Timex watch with a round face. I was elevated by this extraordinary status symbol. That was more than enough but I also got The Lion, the Witch and the Wardrobe, which was read and re-read. And then, to push the experience over the top, a magnetic ladybird (yes, ladybug to you) that was perhaps a centimetre long, with a detachable magnet base. Hours of fun awaited me. We are all magpies, but children are particularly good at constructing their world around their personal possessions, which help differentiate them from the adults around them. My things were very important. I had particular schemes for arranging my ornaments and hated them being disturbed. I had equal love for all the animal and doll toys and felt bereft if I was persuaded to give some away. I remember being really happy when my various uncles gave me rock music for presents — it made me feel like they were accepting me into their grown-up fraternity. Specifically I remember “Stop Making Sense” from my Uncle Bruce, when I was about in 9th grade, and “Little River Band greatest hits” from my Uncle Kim a couple of years previous to that. For a while, my grandmother gave me really girly gifts – a doll of queen Elizabeth, a stickers-and-felt ballet set, where you could stage your own ballets. When I immediately started staging elaborate baseball tableaux with the ballet set, she sinally figured out I didn’t really want girly gifts after all. I had a fuzzy felt ballet, too. Unfortunately, I also had a wild animal set as well. Needless to say, the ballerinas suffered cruelly. Which is funny, as I wasn’t a particularly savage child. But the stupid tutus really got on my nerves, not to mention the prancing. Even then I had a deranged sense of humour. It cracks me up even now. Not so much Swan Lake as Crocodile Lake.